Posted on November 29, 2018 November 16, 2018 , in Hot Tubs. If you are thinking about buying a hot tub, you may be wondering if hot tubs are a lot of work. Truth be told, they have come a long way in the past decade or so and maintenance is quite minimal. In fact, most quality hot tubs are now self-cleaning models and do all the heavy work like vacumming and water skimming on their own. If you are concerned with how much work owning a hot tub may be, here is what you can expect. Caring for a hot tub can be simple and over before you know it. Because of the smooth, acrylic shell, cleaning them is quite effortless. By using just detergent, a washcloth and water, you can easily keep your hot tub clean and in pristine condition for daily soaks or your next big family gathering. 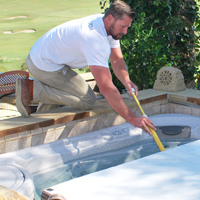 Upkeep of a hot tub is quite simple but one of the most important parts of caring for a hot tub is making sure that the water is clean. The water needs to frequently be sanitized and balanced with a variety of chemicals. In order to determine if your water is balanced correctly, test strips can be used to read the water and will show if additional chemicals are required to adjust the pH balance or alkinity. Testing the water and adding chemicals when needed will keep your water in pristine condition and cause much less work than if the water was neglected and needed to be drained and cleaned. Rinsing out the filters and cleaning them every few weeks is very important and this will help improve the filtration of your hot tub. Every few months the filters will need to be removed and soaked in a specialized solution for a deep clean. Although it may sound like a lot, this routine maintenance involves less than a half hour each month and can be done easily. If you use your hot tub often, you may have to drain it to give it a good cleaning several times per year. When you empty the hot tub, you can easily clean the inside of the hot tub and then refill it, add the chemicals and go right back to relaxing in your hot tub. Having a hot tub has amazing benefits. These benefits can be to increase your overall physical and mental health, to increase time spent with family, to spend time relaxing and enjoying life. These benefits far outweigh the small amount of time that it takes to maintain a hot tub. Most hot tub owners find that it quickly becomes a part of their routine and they don’t think too much about it! Now that you have your answer to if hot tubs are a lot of work, download a buyer’s guide to learn more about their maintenance requirements.